A badly injured Santa Ana police K-9 left the hospital Tuesday after undergoing surgery hours after helping officers dramatically chase down a fleeing carjacker — a pursuit and ensuing struggle that knocked out several of the animal’s upper and lower teeth. 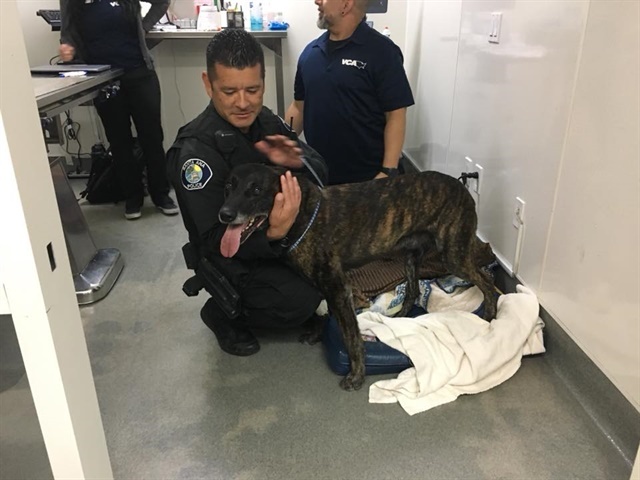 The 8-year-old Dutch shepherd, named Puskas after Hungarian footballer Ferenc Puskás, assisted officers Monday evening in a pursuit involving a carjacking in which the suspect tried to elude pursuing officers as he drove from Santa Ana to Irvine. When the suspect finally emerged from the vehicle, Puskas swiftly chased him down as he tried to flee on foot. Cpl. Anthony Bertagna of the Santa Ana (CA) Police Department said the suspect, identified as 37-year-old Antonio Padilla Jr. of Riverside County, had a 30- to 40-foot lead on Puskas and was running toward an open business. Given the suspect’s dangerous behavior, officers had deployed the K-9. Puskas quickly closed the gap, but police think the dog’s face collided with the concrete while taking the suspect down, knocking out six of his smaller teeth but leaving his canines, the most important teeth for his job, Bertagna said. Doctors had to fully extract each of Puskas’ broken teeth and stitch a large cut on his face, Bertagna told the OC Register. He added that the teeth Puskas lost won’t stop him from doing his job, and that he should be able to work again after a few weeks off.